Rhonda Boyer kills bugs for a living. Rosie Zwaduk manages a storage facility with her husband. Prisillia Baker is a high school junior. By occupation alone, these women have little in common, but they share a bond on the playing field. Boyer, Zwaduk, Baker and others play full-contact football with a women's professional team that formed in Marana last year. "For the first time ever, I'm involved in a team sport," Zwaduk said. "I'm absolutely loving the team camaraderie." First called the Marana She Devils, the team will start playing under the name Southern Arizona She Devils. Practice started earlier this month and so far, the full-contact part hasn't happened yet. For now, practices consist of conditioning exercises and learning football basics, such as how to correctly catch a football and how to block. "The beginning, I have to admit, was pretty rough," Boyer said about those early practices. "I was using muscles I hadn't used in a long time and I was walking funny for a few days." At a practice last week at Arthur Pack Regional Park, there were almost as many coaches as there were players. Ten players were at a practice last Tuesday. All the coaches and players are volunteers. Recruiting efforts are ongoing and anyone with any interest in football is encouraged to look into the team, co-owner and player Sherry Kammeyer said. People are surprised there's a women's football team in Tucson, she said. 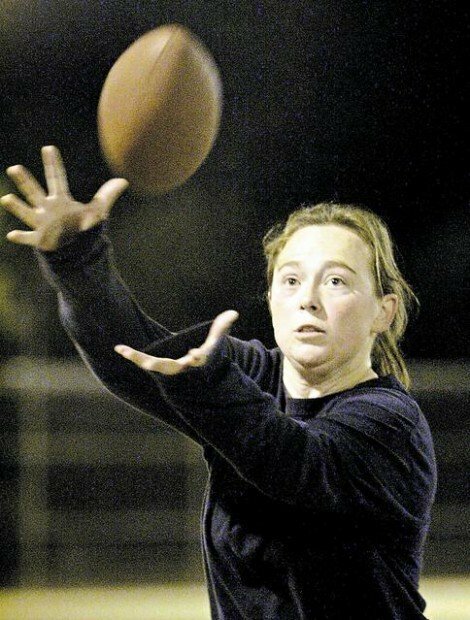 Another full-contact women's team, the Tucson Monsoon, plays in the Independent Women's Football League. The She Devils will play as a 2009 expansion team for the Women's Football Alliance. "People assume that we are flag football or powder puff. Or the lingerie football they see on YouTube," Kammeyer said. "We are full contact. The only difference is, when we take off our helmets, some of us have long hair that falls out of them." Teams in the Women's Football Alliance will follow official NFL rules, but there are some exceptions. For instance, the women will play with a smaller football than the men in the NFL do. Kammeyer owns the team with head coach Brett Holloway. They had to pay a $2,000 league fee so the team could compete in the Women's Football Alliance. Holloway established the She Devils last May and recently asked Kammeyer to come on as co-owner. While most of the players are novices, Kammeyer first played football in 1993 when she was a junior at Palo Verde High School. Kammeyer, 32, still vividly remembers her days as a second-string quarterback for the junior varsity team. In the team's first game of the season, Kammeyer threw for one touchdown and handed the ball off for another two. Palo Verde won the game 86-0, Kammeyer said. "I loved it and I really wanted to further my career, but it's harder for a girl my size," she said. "I didn't even play varsity because the boys were so much bigger their senior year than I was." When Kammeyer found out about two years ago that there was a women's team, the Tucson Monsoon, in town, she went out that same week and watched them play. She ended up playing with the team, but said it wasn't for her. She met Holloway while playing with the Monsoon and she was one of the first people he called when he formed the She Devils. Zwaduk said she's the exact opposite of Kammeyer. While Kammeyer is a huge San Francisco 49ers fan who likes to read books about football, Zwaduk wasn't interested in the sport. "I never even watched it on television," she said. "I never wanted to have anything to do with it." Her husband, Alan Zwaduk, and son, Richard Zwaduk, both coach for the She Devils. She volunteered to help with public relations and soon found herself wanting to put on a pair of cleats after getting to know some of the women on the team. "They are no different than I am," she said. Zwaduk will be a lineman. "I don't want to be anywhere else," she said. "Linemen don't have to worry about what they eat." Zwaduk's son, Richard, recruited Boyer to play. He is employed by Boyer at 1st Choice Termite & Pest. Rhonda Boyer joined to break up her everyday life of killing bugs. She's being considered for positions on offense and defense, including tight end and defense. She wants to see herself on defense as a safety. "That's the one I'm most excited to play," she said. "You are all over the place. You have a chance for the interception." Prisillia Baker wants to start as running back. Baker, 17, is a junior at Sunnyside High School and has wanted to play football since she was a young girl watching her brothers play Pop Warner football. Her parents nixed the idea because doctors said she had scoliosis. She was a cheerleader instead. Today, there is no sign that she has scoliosis and her parents were more willing to let her try football. "It's fun," she said about playing football. "I'm learning a lot of new stuff. There's a lot of stuff I didn't know." The She Devils will start the season in April with a home opener against the Phoenix Prowlers. Kammeyer is still working on finding a home field and a regular practice field. Expectations for the team aren't necessarily on winning the league title, but rather on developing as football players and building a strong bond among players and coaches. "We really want to be involved in giving back to the community as well," Kammeyer said. Want to play for the She Devils? If you are interested in playing with the She Devils, visit the teams Web site at www.maranashedevils.com or e-mail MaranaSheDevils@hotmail.com. More than 30 teams from California to New Jersey will suit up for the 2009 Women's Football Alliance season, which starts in April. The She Devils will play in the American Conference, a division that features the Las Vegas Showgirlz, the California Lynx and the Phoenix Prowlers. To learn more about the league, go online to www.wfafootball.com. ● Contact reporter Andrea Rivera at 806-7737 or arivera@azstarnet.com.